:: The House Sparrow is a thriving species in North America, but its population is declining in its native land. To raise awareness of the population decline, the Nature Forever Society has launched World House Sparrow day on March 20th — mark your calendars to help save a declining species! :: A Kakapo chick has hatched out of an egg that was crushed by its mother and then mended with glue and tape by park rangers. The Kakopo is a critically endangered species with only 125 birds left. :: Something new with Spring in the air: a podcast from the most recent episode of CBC Radio’s comedy show, Laugh Out Loud, featuring (in the last five minutes or so) comedian Pete Zedlacher on the American Eagle vs. Canada Goose. :: From Nicholas at Hipster Birders: Scoter Trifecta! 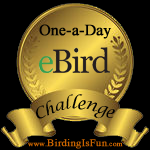 This entry was posted in Bird Conservation, Birding, Birding News, Blogging, Canada Birds, General Birding and tagged Birding News, Blogging. Bookmark the permalink.